Our weekly dance event at the The 94th Aero Squadron Restaurant. You will hear the coolest versions of swing, waltz, latin and even Motown songs. During our weekly dance event at the 94th, you can expect to hear everything from a beautiful waltz music through modern disco hits. These songs will include titles only a big band can play well, other tunes come from the great American songbook. As the evening continues, you will hear the coolest versions of swing, waltz, latin and even Motown songs like you haven’t heard in years. 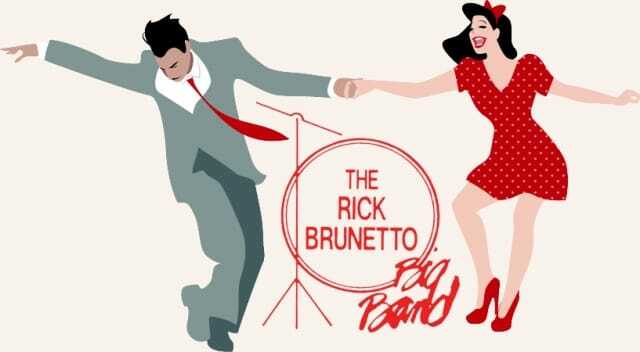 This June, 2019, the Rick Brunetto Big Band will celebrate 30 years of every Thursday Night at the 94th Aero Squadron. Join us for a magical night of great music and dancing in the Cabaret Lounge. As one of Columbus’ premiere restaurants you can enjoy great steaks, prime rib sea food, chicken, pasta and a variety of salads and desserts from Chef Juan. Dining is available in the dining room with a spectacular view of the Airport runways or in the Cabaret Lounge where the band performs. Reservations are not necessary most of the time, but on our themed evenings and special dance nights (Valentine’s Day, Mother’s Day, 4th of July celebration, Halloween, Christmas and New Years Eve parties) reservations are recommended. Make sure you are not missing the special dance night! You can reserve your table by calling the 94th Aero Squadron at 614-237-8887. Cover $10. Copyright © 2019 Rick Brunetto Big Band. All Rights Reserved.